With the financing available for the independent refiner to acquire another refinery from ExxonMobil, investors have been gobbling up PBF's shares. 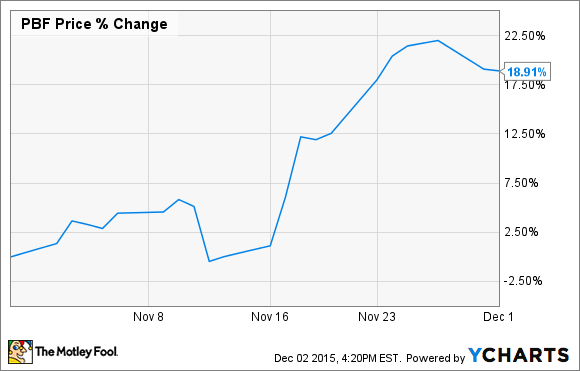 What: Shares of PBF Energy (NYSE:PBF) climbed more than 19% in November. A large part of the stock's success last month came on the back of the company's ability to secure financing or the pending acquisition of ExxonMobil's (NYSE:XOM) Torrence refinery in California. It also helps that the market is extremely lucrative for refiners for the past several quarters. So what: This has been a pretty transformative year for PBF Energy. With the pending acquisition of the Torrance refining complex and the recently completed acquisition of Chalmette Refining -- also a former Exxonmobil facility -- PBF has increased its total refining capacity by 60% to 900,000 barrels per day. These two deals also make it the fifth largest independent refiner in the United States. There were some questions whether PBF was going to be able to finance its Torrence deal attractively, especially since financing hasn't been easy to find lately for energy companies. On Nov. 17, the company announced that it had successfully priced $500 million worth of senior notes due in 2023 at 7%. It's not a great financing deal, but for a company of PBF's size and capital structure, it's a rate the company can live with. What's helped the company be so aggressive this year in making deals is that margins across the entire refining space have been spectacular. Not counting a non-cash writedown of crude inventory values, net income per share increased 15% compared with this time last year. Since PBF didn't need to raise a lot of cash through an equity issuance to fund its recent acquisitions, chances are those EPS numbers will improve in the coming quarters. Now what: As long as the refining margins between cheap gasoline and even cheaper crude oil remain high, PBF Energy should be able to significantly boost profits as it continues to buy back stock and brings its new assets into the fold. One thing to keep in mind with any refining stock, though, is that price swings in crude oil or refined products could eat into those margins pretty quickly. The big question for PBF will be if it can keep paying for its recent acquisitions in the event that refining margins become much weaker than the boom times of today.